Taking the kids to the movies sounds like fun, provided battling with snack bar wish-lists, toilet trips and crazy kids on sugar-highs don't scare you. Kidspot has all the tricks to make a trip to the movies an enjoyable family day - all without chains and gags OR breaking the budget. Don't over-extend the kids - be sure that you've chosen a suitable film for your children's ages and that the running time isn't too long. Avoid the busier opening days, especially with younger children, as the large crowds can mean long lines and limited seating options, as well as more noise and fuss. Save yourself time at ticket counters and snack bars, and get organised before you even leave the house. You can buy your tickets online at most cinemas, and bringing snacks from home saves money as well as time. For a budget-friendly cinema visit, skip the snack bar treats. You'll not only save money, but you'll also be able to limit the inevitable sugar rush that choc-tops and lollies bring. As a compromise, grab a family-sized box of popcorn to share - what kid doesn't love a box that's bigger than his head? Also, bringing small drinks like poppers can help to avoid excess toilet-trips. It's time to roll out a few basic rules. Make sure your children know the usual cinema rules about being quiet, staying in their seats and not disturbing other movie-goers. Ask them to remind you of the rules before you go inside the cinema - that'll make sure they remember. Make sure the kids (and you) are well-rested and choose a time of day that suits your general routine if you have a toddler still napping in the daytime. For your sake, and for your fellow movie-goers, expect the possibility that you may need to leave before the movie is finished. If your child needs consoling, it's often more comforting to leave the dark cinema and soothe them in the light of the foyer. 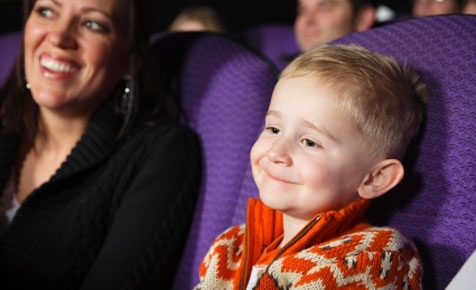 If your children are unruly or misbehaving, you may have to go through with your pre-arranged consequences, which may or may not include leaving the movie altogether. Trying to get kids to sit still through two hours of anything can be a lesson in futility. Make it easy on them by skipping the endless previews and ads at the start of a film. Ask the cashier the exact time the main feature will start and don't head in to the theatre until then. Just before the main feature starts is a perfect time for last-minute trips to the restrooms. You know a quick escape is going to be easier if you're already near the aisle. Imagine trying to climb over legs and handbags with a tantruming toddler in tow?! Make it easy on yourself to leave quickly and quietly - this is also handy for kids who may need a loo trip or two during the movie. Most mainstream chain cinemas have booster seats available for small children - just ask at the ticket desk. This is definitely worth considering, as it will mean a more pleasant experience for both adult and child - the ultimate goal here is to keep your lap child-free for an hour or two! Go to the movies with another family - it can make the whole experience that much more manageable and fun. There's not only another adult to help supervise, handle toilet trips and offer moral support. Kids often respond well to the peer pressure of wanting to behave in front of their friends - or at least avoid getting in trouble in front of them! Server responsed at: 04/25/2019 3:58 a.m.